Hepatitis B- and C-associated nephropathies are the most common of their extrahepatic manifestations. The reported prevalence of hepatitis-associated nephropathy closely parallels the prevalence and distribution of hepatitis B and C. Almost all forms of glomerulonephritis (GN) are reported with hepatitis B and C., The most important mechanism involved in the development of glomerular disease is immune complex mediated. The treatment of hepatitis-associated nephropathy mainly involves the reduction of viral replication and thereby reducing the production of immune complexes. In this retrospective study, we analyzed the clinical, biochemical, serological, and pathological profile of 27 patients with hepatitis B or C infection and GN. Retrospective renal biopsy registry of 534 patients from January 2013 to December 2015 was analyzed. The demographic, clinical, biochemical, serological, and treatment data of the cases were analyzed by standard analytical methods. All the serological markers of hepatitis B [hepatitis B surface antigen (HBsAg), hepatitis B e antigen (HBeAg), immunoglobulin M (IgM) anti-hepatitis B c antigen (HBcAg), and immunoglobulin G (IgG) anti-HBcAg] and the hepatitis B and C viral loads and complement levels were also done in all cases. The kidney biopsies were studied by light microscopy using hematoxylin and eosin, Congo red, Masson’s trichrome, period acid-Schiff, silver methenamine stain, and by immunofluorescence for antibodies against IgG, IgM, immunoglobulin A (IgA), and C3. Immunohistochemical staining for serum amyloid A was done in two cases of amyloidosis. Immunohistochemical staining for viral particles in biopsy specimens was not done. Electron microscopic studies were not done as the facility is not available in our center. Among 534 biopsies available for analysis, 16 (2.9%) patients were HBsAg positive and 11 (2.05%) patient were anti-hepatitis C virus (HCV) positive. None of these patients were symptomatic for hepatitis, and they were presented with symptoms related to kidney involvement. In the hepatitis B group, the average age was 40.5 years. Ten out of 16 patients presented with nephrotic syndrome and six with nephritic syndrome. The most common morphological picture on biopsy was membranous nephropathy (MN) which was seen in six of 16 (37.6%) patients, followed by membranoproliferative glomerulonephritis (MPGN) and focal segmental glomerulosclerosis (FSGS) (both 3/16, i.e., 18.75% patients). Two patients had IgA nephropathy (IgAN), and one patient each had amyloidosis and minimal change disease (MCD) on biopsy. The data are summarized in [Table 1]. Regarding renal function at presentation, six patients were in glomerular filtration rate (GFR) range between 60 and 89 mL/min/1.73 m2, both GFR >90 and GFR 30 to 59 groups had four patients each, and two patients had GFR <30 [Figure 1]. Table 1: Summary of hepatitis B positive patients. 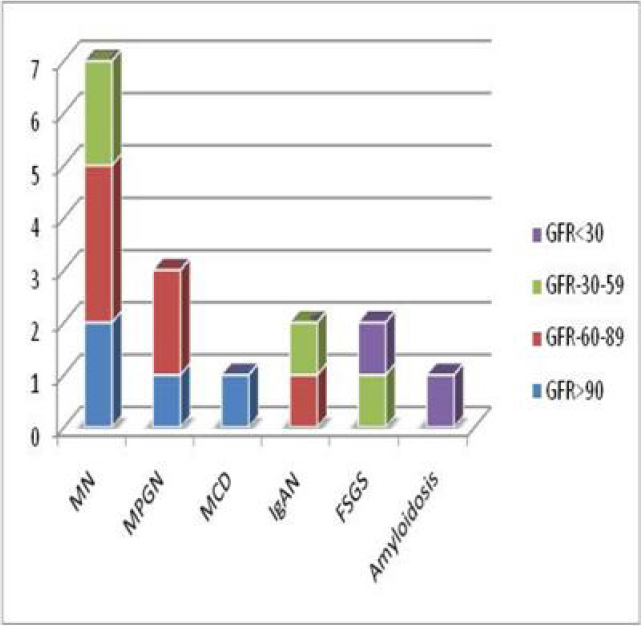 Figure 1: Distribution of patients of hepatitis B with relation to GFR. GFR: Glomerular filtration rate, MN: Membranous nephropathy, MPGN: Membranoproliferative glomerulonephritis, MCD: Minimal change disease, IgAN: Immunoglobulin A nephropathy, FSGS: Focal segmental glomerulosclerosis. 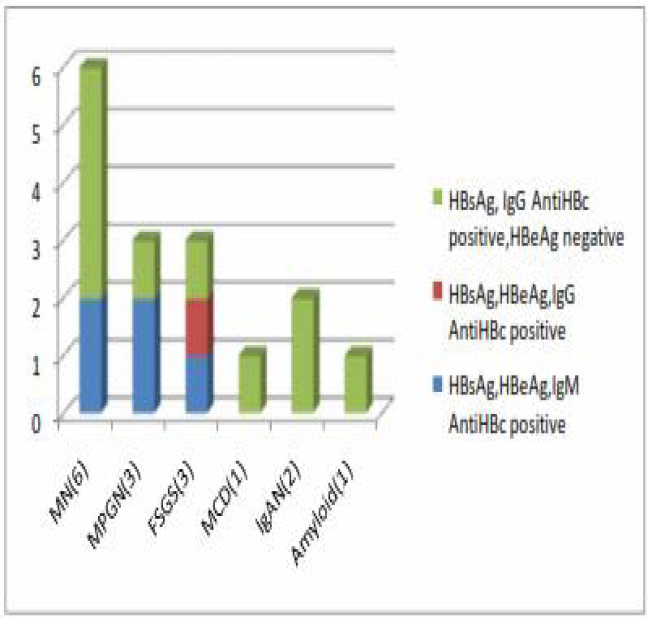 Five patients were having possible acute hepatitis B as interpreted by their hepatitis B serology panel (HBsAg, HBeAg, and IgM anti-HBc positive) and two of them had MPGN on biopsy, whereas two had MN and one had FSGS. Among patients who are probable chronic asymptomatic carriers (HBsAg, IgG AntiHBc positive, and HBeAg negative), 40% (4/11) patients had MN on kidney biopsy [Figure 2]. Three patients had low C3 levels, two patients with MPGN, and one with MN, whereas all remaining patients had normal complement levels. Figure 2: Distribution of pathological lesions with relation to hepatitis B serology. MN: Membranous nephropathy, MPGN: Membrano-proliferative glomerulonephritis, FSGS: Focal segmental glomerulosclerosis, MCD: Minimal change disease, IgAN: Immunoglobulin A nephropathy. Average age of presentation of HCV-positive patients was 42.1 years. Six patients had nephritic and remaining five had nephrotic picture at presentation. Most common morphological pattern in kidney biopsy was MPGN involving five out of 11 patients (45.45%) followed by MN in four patients (36.36%). One patient had IgAN and the remaining patients had amyloidosis in biopsy. Four out of 11 patients had preserved GFR at presentation, i.e., >90 mL/min/1.73 m2. 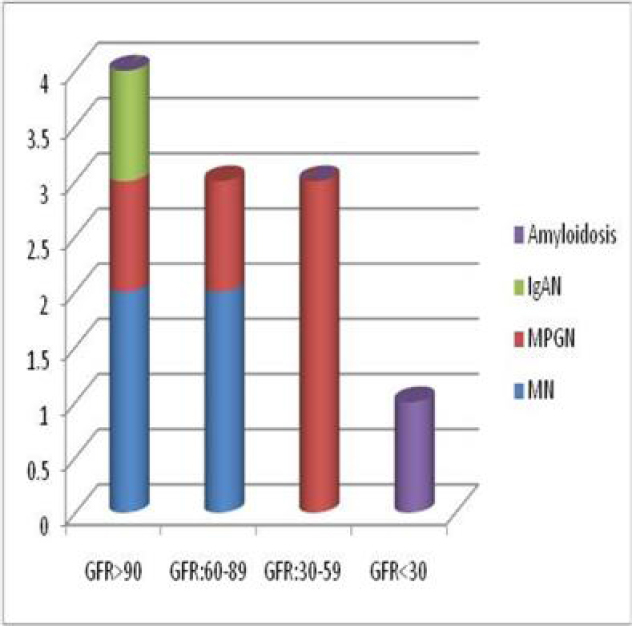 Three of five patients of MPGN had a GFR of <60 at presentation, and the patient with amyloidosis had GFR of <30 [Figure 3]. Only two patients had low C3 levels and both were having MPGN in kidney biopsy, whereas all remaining patients had normal complement levels. The data are summarized in [Table 2]. Table 2: Distribution of patients with hepatitis C.
Figure 3: Distribution of patients with relation to GFR. All the patients were treated according to the standard protocols for the management of glomerular nephritis and viral hepatitis. In HBsAg-positive group, four patients were lost to follow-up. One patient with amyloidosis and one patient with FSGS expired (the patient with FSGS was started on entecavir, but expired within a period of one month). Two patients of FSGS and patient with MCD were started on antivirals followed by steroids and achieved remission in three to six months. These patients were started on entecavir with dose adjusted according to their renal function, and prednisolone was started two weeks after the initiation of entecavir. All the patients received steroids for a period of six months as per KDIGO guidelines, and entecavir was continued for a minimum of two weeks after the stopping of steroid. Among patients of MN, five patients were available for follow-up, and all were started on ACEI/ARBs and standard supportive therapy. Two of them received antiviral treatment with entecavir as indicated by hepatitis B virus (HBV) DNA levels and serological status. At six months of follow-up, none of them had worsening of renal function, and one patient (who received entecavir) achieved remission of proteinuria. Two patients with MPGN were available for follow-up; both received antiviral therapy with (as indicated by HBV DNA levels and serological status) and at three months of follow-up, their renal functions remained the same. In the HCV-positive group, eight patients were available for follow-up, one patient with amyloidosis expired. Three patients with MN and three patients with MPGN received Interferon and ribavirin and one patient with MPGN with GFR <60 received interferon monotherapy. All of them received standard supportive therapy and none received immunosuppression. At 12 weeks of follow up early virological response was achieved in 4/7 patients and one (with MN) achieved remission of proteinuria. Infection with hepatitis B and C is prevalent throughout the world. Approximately, 350 million people are infected with hepatitis B, and about 3% with hepatitis C. Hepatitis B-associated nephropathy is recognized as an important extrahepatic manifestation of hepatitis B. HCV is also associated with cryoglobulinemia in 40% of. Both hepatitis B and C are associated with different forms of GN including MN, MPGN, IgAN, FSGS, fibrillary and immunotactoid glomerulopathy, and amyloidosis. In our study also, the most common lesion found was MN followed by MPGN. Interestingly, three of 16 patients had FSGS. One of these three patients among who had GFR of 20 mL/min/1.73 m2 expired after three months of follow-up. The other two patients were started on entecavir followed by steroids and showed complete clinical remission in six months. The cases with amyloidosis and MCD could be chance findings. Immunohistochemistry for serum amyloid-A (SAA) was positive in the patient with amyloidosis. Two of the five patients with possible acute hepatitis B had MPGN on biopsy. This is similar to the report by Lei Zhang et al. Another important observation from this study is that none had symptomatic liver disease. The majority of patients (10 out of 16) had GFR >60 at presentation. Unlike of the pediatric population where HBVMN has a relatively benign course, spontaneous remission is seen in only 30%–60% of adults with HBV-associated GN and 20%–30% may develop irreversible renal damage., Therefore, it could be of value in routine screening hepatitis B chronic carriers for renal involvement as an early intervention may prevent further progression of the kidney disease. The most common glomerular disease associated with HCV is MPGN followed by MN. Other reported associations include FSGS, IgAN, thrombotic microangiopathy, fibrillary and immunotactoid GN, and amyloidosis., and cryoglobulinemia. Mechanisms include deposition of immune complexes, amyloid deposition, mesangial inflammation, endothelial injury, and podocyte injury. Circulating mixed cryoglobulin complexes are seen in around 50% patients with chronic hepatitis C infection, even though overt symptoms of cryoglobulinemia are seen in only 5% patients. The prevalence of MPGN is higher in HCV patients with cryoglobulinemia. HCV RNA has been reported to be present in 80% of cases of cryoglobulinemia-related MPGN but only in 25% of MPGN cases without cryoglobulinemia. MPGN was the most common lesion in our study accounting for 45.45% of cases (5/11) followed by MN. Two patients had low C3 levels, but none of the patients had overt symptoms of cryoglobulinemia. Serum testing for cryoglobulins was not done. One patient in our study had FSGS on biopsy. There are several case reports of HCV-associated FSGS with the possible mechanism being direct podocyte injury by the HCV virus., One patient had amyloidosis. Only limited number of cases of HCV and amyloi-dosis are reported., Immunohistochemistry for SAA was positive, confirming the secondary origin of amyloidosis and we ruled out other secondary causes of amyloidosis. Seven out of 11 patients had a GFR >60 at presentation. Only one – the patient with amyloid kidney had a GFR of <30. KDIGO guidelines recommend patients with HBV and GN be treated with interferon or nucleoside analogs as recommended for general population with HBV infection with dose modifications according to renal functions. RCTs are needed to establish the most effective regimens to prevent the progression of kidney disease. As per KDIGO recommendations, patients with HCV GN should receive interferon + Ribavirin if GFR is more than 60 and interferon monotherapy if GFR is <60 with dose modified according to GFR. The recently developed directly acting antiviral agents (DAAs) have revolutionized the management of hepatitis C. Novel DAAs are provided with rapid activity which may be an advantage over interferons, especially in treating patients with conditions such as rapidly progressing GN. However, extremely limited data exist on the use of DAAs in HCV GN, and we need to further evaluate their role in the management of HCV-induced glomerular disease. In summary, in our study, the most common form of GN in hepatitis B-positive patients is MN and in hepatitis C-positive patients is MPGN. Our study also showed a relatively increased frequency of FSGS in hepatitis-infected patients even though we could not ascertain a causative association. The majority of the patients had a relatively preserved renal function when they presented with nephrotic/ nephritic syndrome and were asymptomatic for their liver disease. The most important limitation was the retrospective nature of the study so that we were not able to assess response to treatment and progression of disease. Second, immunohistochemistry for viral markers on kidney biopsy specimens was not done. The detection of viral markers in glomeruli could have been helpful in establishing a causal association in cases of FSGS and amyloidosis. Electron microscopy of renal biopsy specimens was not done in our study. Electron microscopic detection of viral particles has been reported in few studies of hepatitis-associated GN. Viral-related particles can be detected as 35–40 nm sized particles in the electron dense deposits in the paramesangial areas. Hence, electron microscopy also could have been helpful in establishing a causal association in a condition such as FSGS. Despite the wide prevalence of hepatitis B and C, there is a paucity of data regarding hepatitis-associated nephropathy in our country. Prospective studies may reveal a probably changing spectrum of GN associated with hepatitis B and C. Such studies could suggest a better correlation between the serological markers of hepatitis B and pathological lesion in the kidney which could change the algorithm of evaluation of hepatitis-associated kidney diseases. Most importantly, randomized controlled trials are needed to develop guidelines specific for the treatment of hepatitis Band C-associated GN. Gupta A, Quigg RJ. Glomerular diseases associated with hepatitis B and C. Adv Chronic Kidney Dis 2015;22:343-51. Ozkok A, Yildiz A. Hepatitis C virus associated glomerulopathies. World J Gastroenterol 2014;20:7544-54. Panomsak S, Lewsuwan S, Eiam-Ong S, Kanjanabuch T. Hepatitis-B virus-associated nephropathies in adults: A clinical study in Thailand. J Med Assoc Thai 2006;89 Suppl 2:S151-6. KDIGO clinical practice guidelines for glomerulonephritis. 2012. European Association for the Study of the Liver. EASL clinical practice guidelines: Management of chronic hepatitis B virus infection. J Hepatol 2012;57:167-85. Sorrell MF, Belongia EA, Costa J, et al. National Institutes of Health consensus development conference statement: Management of hepatitis B. Ann Intern Med 2009;150:104-10. Lai KN, Li PK, Lui SF, et al. Membranous nephropathy related to hepatitis B virus in adults. N Engl J Med 1991;324:1457-63. Bhimma R, Coovadia HM. Hepatitis B virus-associated nephropathy. Am J Nephrol 2004; 24:198-211. Zhang L, Meng H, Han X, et al. The relationship between HBV serum markers and the clinicopathological characteristics of hepatitis B virus-associated glomerulonephritis (HBV-GN) in the Northeastern Chinese population. Virol J 2012;9:200. He XY, Fang LJ, Zhang YE, Sheng FY, Zhang XR, Guo MY. In situ hybridization of hepatitis B DNA in hepatitis B-associated glomerulonephritis. Pediatr Nephrol 1998;12:117-20. Tadokoro M. The clinico-pathological studies of hepatitis B virus nephropathy in adults. Nihon Jinzo Gakkai Shi 1991;33:257-66. Cacoub P, Renou C, Rosenthal E, et al. Extrahepatic manifestations associated with hepatitis C virus infection. A prospective multicenter study of 321 patients. The GERMIVIC. Groupe d’Etude et de Recherche en Medecine Interne et Maladies Infectieuses sur le Virus de l’Hepatite C. Medicine (Baltimore) 2000;79:47-56. Kubo Y, Tasaka T, Sano F, et al. Amyloid-associated amyloidosis in a HCV carrier with non-Hodgkin’s lymphoma who had been treated with autologous stem cell transplantation and rituximab. Leuk Lymphoma 2007; 48:2075-8. Barsoum RS. Hepatitis C virus: From entry to renal injury – Facts and potentials. Nephrol Dial Transplant 2007;22:1840-8. Lunel F, Musset L, Cacoub P, et al. Cryoglobulinemia in chronic liver diseases: Role of hepatitis C virus and liver damage. Gastroenterology 1994;106:1291-300. Misiani R, Bellavita P, Fenili D, et al. Hepatitis C virus infection in patients with essential mixed cryoglobulinemia. Ann Intern Med 1992;117:573-7. Sperati CJ. Stabilization of hepatitis C associated collapsing focal segmental glomerulosclerosis with interferon alpha-2a and ribavirin. Clin Nephrol 2013;80:231-4. Shah HH, Patel C. Long-term response to peginterferon in hepatitis C virus-associated nephrotic syndrome from focal segmental glomerulosclerosis. Ren Fail 2013;35:1182-5. Miranda BH, Connolly JO, Burns AP. Secondary amyloidosis in a needle phobic intravenous drug user. Amyloid 2007;14:255-8. Sabry A, E-Agroudy A, Sheashaa H, et al. 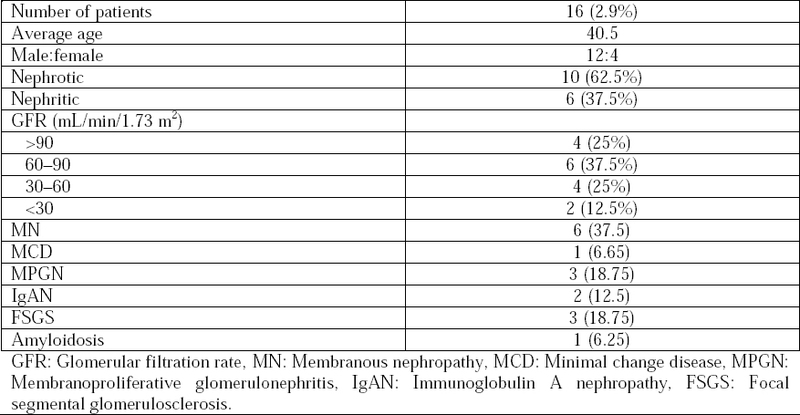 HCV associated glomerulopathy in Egyptian patients: Clinicopathological analysis. Virology 2005;334:10-6.